Nigeria's main opposition has chosen former Vice President Atiku Abubakar as its candidate for the 2019 elections as it seeks to remove President Muhammadu Buhari. The nomination of Abubakar, 71, by the People’s Democratic Party (PDP), sets the stage for what is expected to be a fiercely contested poll in Africa's largest economy. Abubakar hopes to replicate Buhari’s 2015 feat, when the latter became the first opposition candidate in Nigerian history to defeat a sitting president. Abubakar, who had been the country’s vice president between 1999 and 2007, left the ruling All Progressives Congress (APC) party in November and re-joined the PDP. Buhari, 75, has already been selected by the ruling party as its candidate. Next year's presidential race appears to have tightened in recent months, with the APC hit by a wave of defections over Buhari's leadership style. Abubakar comes from the Muslim-majority north and his nomination follows an unwritten rule in Nigeria that the presidency should alternate every two terms between a candidate from the north and south. In 2015, Buhari's victory over former President Goodluck Jonathan was marked by a wave of optimism, which seems to be in decline now. In May, his approval rating plummeted to 41 percent from a peak of 80 percent in October 2015, according to NOIPolls, a Nigerian polling service. There have also been concerns about his fragile health, his economic policies, the extent of his claims about better security, as well as the targets of his campaign against corruption. However, Niyi Akinsiju, coordinator of Buhari Media Organisation, told Al Jazeera that Buhari's chances of re-election are "very high". "He has developed a trusting relationship with the people who have confidence in his fidelity and integrity in the exercise of power," he said. The PDP is hoping Abubakar will be able to leverage Buhari’s dwindling fortunes. 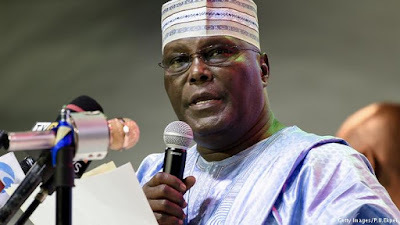 "Atiku Abubakar is seen by a majority of Nigerians as the candidate with the magic solution to the crisis plaguing our nation," PDP spokesman Kola Ologbodiyan told Al Jazeera. "He has a respectable pedigree within the political class across party leanings," he said. The country's electoral commission has cleared 19 candidates to challenge Buhari in the February election. Oby Ezekwesili, 55, a two-time minister and former vice president for Africa at the World Bank, is among other standout candidates. She is the cofounder of the #BringBackOurGirls group to raise awareness about more than 200 schoolgirls kidnapped by armed group Boko Haram in 2014. "Governance keeps worsening. So we the citizens have decided to get into the political arena to make things right," Ezekwesili said. Kingsley Moghalu, former UN official and deputy governor of Nigeria's central bank, is also in the race. An optimistic Moghalu even points to recent history for an "upset victory" for a non-mainstream candidate. "It happened with Trump. It happened with Macron," he said. Hamza al-Mustapha, controversial security chief of the country's former military ruler, Sani Abacha, is also in the race. He has never held any political position. In July, 39 registered political fronts, including the PDP and a splinter group from within the ruling party, signed an agreement to form the Coalition of United Political Parties (CUPP). The splinter group of disaffected APC members led by Buhari's former ally, Buba Galadima, criticised the president's tenure as "a monumental disaster". Ahead of his election in 2015, Buhari promised to tackle Boko Haram as well as fight corruption, revive the economy and provide jobs. "He has stabilised the economy, reduced the Boko Haram insurgency from an invading army to opportunistic terrorists. His fight against corruption has reduced acts of brazen corruption and bureaucratic impunity," Akinsiju said. Nigeria, Africa's top oil producer and the continent’s biggest economy, entered its first recession in 25 years in 2016, mainly caused by lower oil prices and attacks in the Niger Delta crude production region. It emerged from recession in early 2017, but economists say growth remains sluggish and inflation has remained high. Buhari’s supporters claim he has stabilised the economy. "The economy has witnessed an unprecedented, consistent decline in inflation rate over an 18-month period reducing from a high of 18.7 percent in January 2017 to 11.14 percent in July 2018," Akinsiju said. But the opposition is confident the economic situation will dent Buhari’s popularity. "Atiku understands this nation and its economy. He is a personality that can take charge of his environment and comes up with decisions that affect the people positively," Ologbodiyan said.